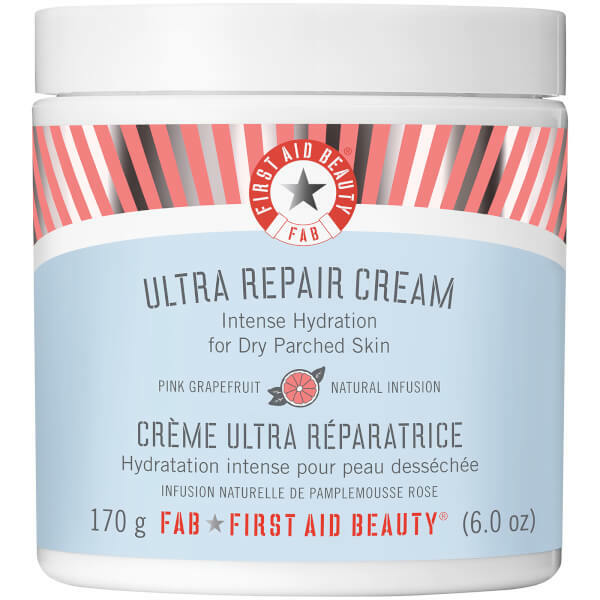 Nourish your skin with the First Aid Beauty Ultra Repair Cream Pink Grapefruit, an intensely hydrating formula clinically proven to more than double hydration immediately upon application. Deeply moisturising and comforting, the hydrating moisturiser addresses dry, flaky and parched skin to leave it feeling smoother, hydrated and comforted in a single use. 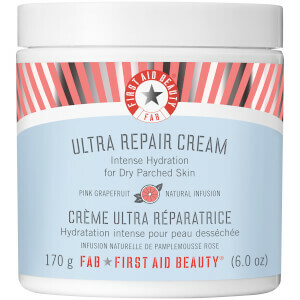 A combination of Colloidal Oatmeal, Shea butter and Ceramide 3, plus the FAB antioxidant booster provides immediate relief and visible improvement to thirsty skin. Its subtle infusion of Grapefruit essential oil leaves skin delicately scented. Water/Aqua/Eau, Stearic Acid, Glycerin, C12-15 Alkyl Benzoate, Caprylic/Capric Triglyceride, Glyceryl Stearate SE, Glyceryl Stearate, Cetearyl Alcohol, Butyrospermum Parkii (Shea) Butter, Squalane, Dimethicone, Colloidal Oatmeal, Allantoin, Citrus Aurantium Dulcis (Orange) Peel Oil, Citrus Paradisi (Grapefruit) Peel Oil, Citrus Tangerina (Tangerine) Peel Oil, Glycyrrhiza Glabra (Licorice) Root Extract, Chrysanthemum Parthenium (Feverfew) Extract, Camellia Sinensis Leaf Extract, Ceramide NP, Caprylyl Glycol, Phenoxyethanol, Xanthan Gum, Sodium Hydroxide, Disodium EDTA, Linalool, Limonene, Citral.